Roadblocks go on pink cards, as those are things I need to stop doing. 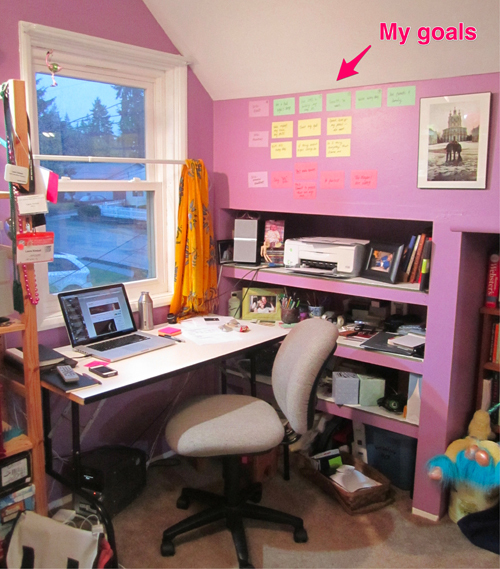 I have three main goals for the year and two things that I need to do more of. Mantras, sayings, and expressions to keep you centered. 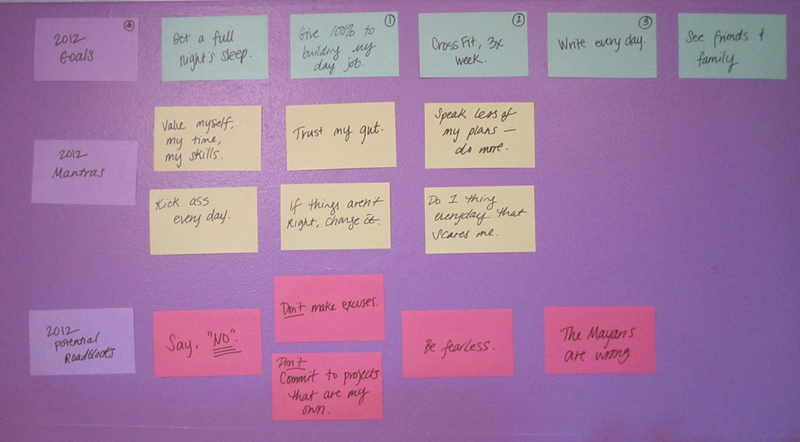 These are my favorite and I’m putting them on my wall to keep myself accountable and remember what’s important to me. I’ll probably add more as the year goes on (or not). I’ve actually started writing down the thing I do each day that scares me as another way to keep myself accountable, and because I’m curious to see what that says about me a year later. Doing one thing that scares me every day is not about going skydiving, but something like going to a networking event, alone, where I don’t know anyone and introducing myself. Would you do that on a normal day? If the answer is, “no,” then that could be your one-thing. These are things that I recognize might prevent me from meeting my goals. Since I’ll be looking at these cards every single day, I didn’t want to write, “Don’t say yes” or “don’t be fearless” when I need to have a list of things that I should do to prevent the roadblocks. If that doesn’t make sense, read this blog post by Jeff Baumgarten, 30 Things…To Do (Riff). Fearing the end of the world is no reason to keep me from meeting my goals. To be honest, I don’t know. But I’m going to try it. I also have some friends who have signed up to help me stay accountable. How do you make sure you meet your New Year goals? This entry was posted on Monday, January 2nd, 2012 at 9:58 pm and is filed under life & observations. You can follow any responses to this entry through the RSS 2.0 feed. You can leave a response, or trackback from your own site.